CHARMING AND SPACIOUS FULLY FURNISHED TWO BEDROOM APARTMENT ON THE SECOND (TOP) FLOOR WITH SUNNY BALCONY (SOUTH) AT THE BACK. LOCATED ON A QUITE AND FRIENDLY ONE-WAY STREET IN THE MIDDLE OF THE BEZUIDENHOUT. 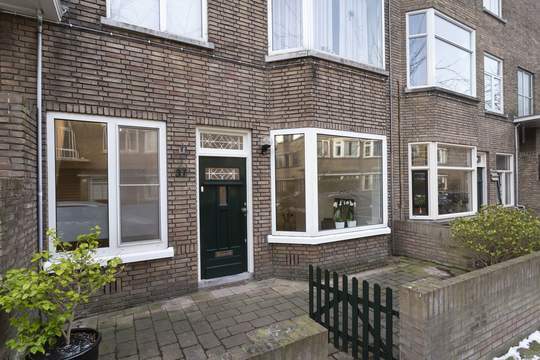 VERY CLOSE TO SHOPS, PUBLIC TRANSPORT, HIGHWAY, TRAIN STATION AND THE HAGUE CENTER. Open stairway to first floor, entrance hall with storage, stairway to top floor, charmiug and spacious living-/dining room ensuite with traditional sliding door separation with fitted cupboards, wooden floor end original mantlepiece, French doors leading to the sunny balcony at the back facing south. Modern kitchen at the back with built-in appliances (fridge, freezer, dishwasher, oven, gas hob and extractor), also accees to the balcony from the kitchen. Good sized bedroom at the back. Modern bathroom with shower, design handbasin, towel heater. Laundry, big bedroom at the front. Separate modern toilet. - Max stay 2 years!